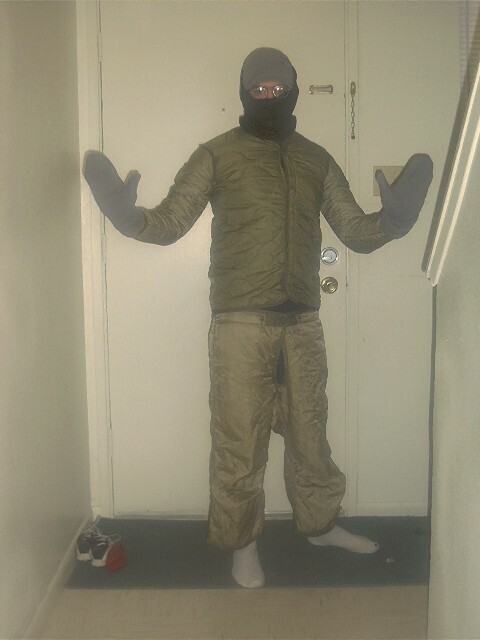 I have used this insulation level to 7°F so far and been fine. At that point I'm wearing everything I carry. 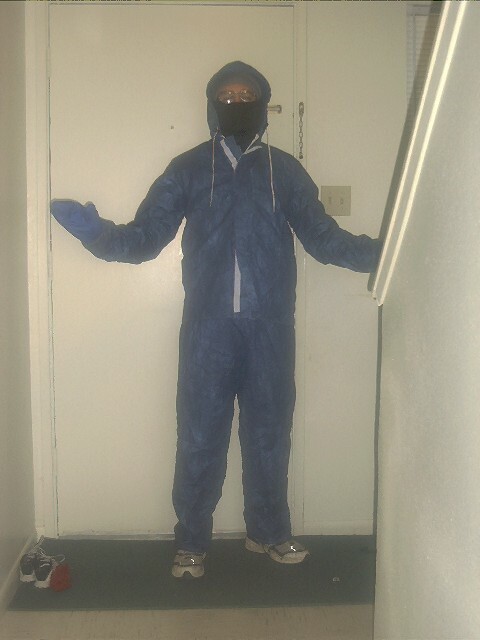 The left picture is the insulation, the right is how I wear it - with the rain gear on top as a barrier to wind and rain. I look like a hiker ninja. 2.1 Polypropylene hat Polypropylene tube that can be made into a hat, balaclava, neck warmer, etc. 3.5 Army wool trigger finger mittens Not the lightest set of mittens, but damn warm, especially when combined with the OR rain mittens. The bonus is that you still have some dexterity if you need it. 3.4 Thorlo Light Hiker Socks Thicker socks to use in cold weather. At this level, I only wear the socks in camp, when walking my feet stay warm enough. Liners on bottom, Thorlos next, and Seal Skinz on top inside my shoes. 10.4 Army Field Jacket Liner Tough rip-stop nylon shell is quilted with polyester fiber batting interior for warmth. Sew up the armpit holes, sew the front to the second button, add a top button, and put some velcro between the top of your new seam and the top button to make a poor man's pullover for about $5-$10. 8.9 Army Field Pants liners Tough rip-stop nylon shell is quilted with polyester fiber batting interior for warmth. Same thing as the Army Field Jacket Liner. I don't need the pants as often as I need the jacket.